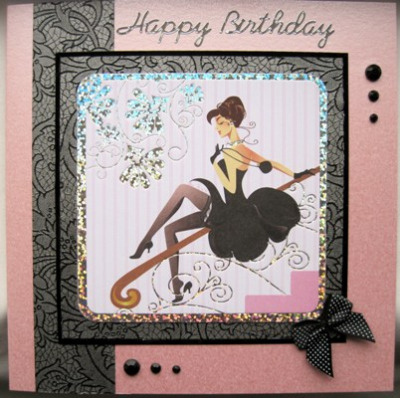 Coral pink card 144cm sq with picture of sassy girl in black dress on banister rail, edged with silver holographic border on black lace paper, trimmed with black and white polkadot bow and black gems. The words 'Happy Birthday' are embossed in silver, and there is space to add an age number in the top right corner. Please use the form below to add or change details. The inside has been left blank for your own special message.